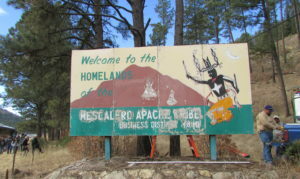 The Mescalero Apache Tribe has received funding through the Economic Development Administration to create an economic development strategic plan. We would like to get feedback from community members to help guide this process. Below is a link to the community survey, which asks questions regarding current businesses of the Tribe, the types of new business you would like to see in Mescalero, and how we can promote or support individual Tribal member businesses. The survey is not very long, with only 15 questions. If you would like to provide input into this process, please take a few minutes out of your busy day, and complete the survey. Please feel free to forward this link to your friends and family. If you do not like using the internet version of the survey, there is also a paper copy. If you fill out the paper copy, please put it in an envelope and return it to the Division of Resource Management and Protection, ATTN Thora Padilla. You do not have to put your name on the survey. If you have any questions, please feel free to call Thora Padilla at 464-4711. The Mescalero Tribal Inauguration was nothing short of monumental. The convention center at the Inn of the mountain gods was packed full of eager tribal members and guests wanting to welcome the newly elected tribal leadership. This year, as a result of the 2017 general election, women are the majority within the tribal council. 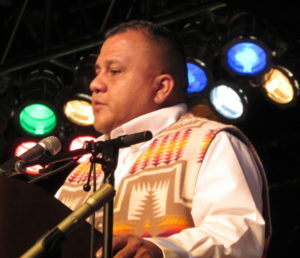 General Manager of Mescalero Apache Telecom Inc., Godfrey Enjady, emceed the event. Mr. Enjady helped the program run accordingly in which he did an exceptional job. At certain points during the program, he had the chance to share anecdotal stories about some of the elected individuals. The feeling of family and community was in the air. Mescalero’s Post 48 started the agenda with posting of the colors and as per usual, doing so with pride. Miss Mescalero, Autumn Pilcher shared a few encouraging words and announced special guests from across the state who were in attendance. The youth of Mescalero also helped the event to be special. Turquoi Garcia, a student at ENMU-Portales, sang the national anthem and the Mescalero boys basketball team said the pledge of allegiance. Instead of the oath of office being recited one by one, expectation took a back seat. 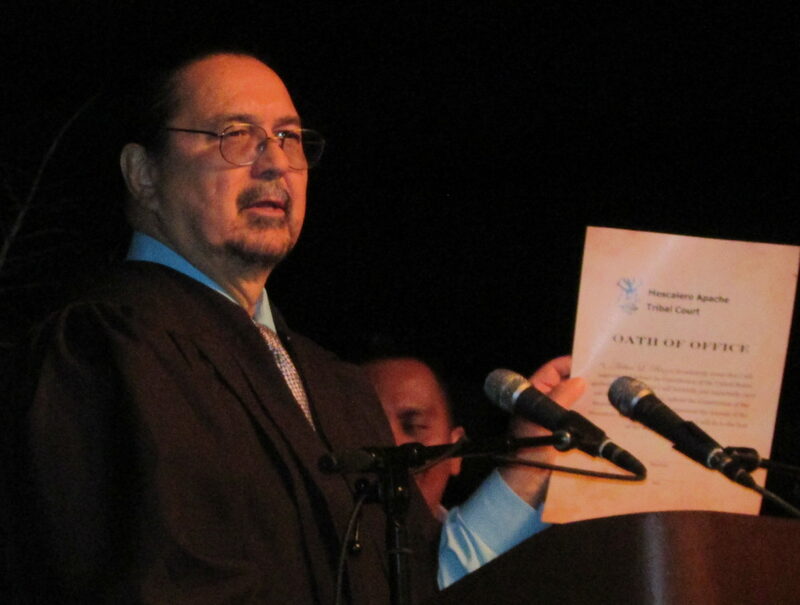 All six individuals stood and repeated the oath of office simultaneously with the help from Chief Judge Monteau. 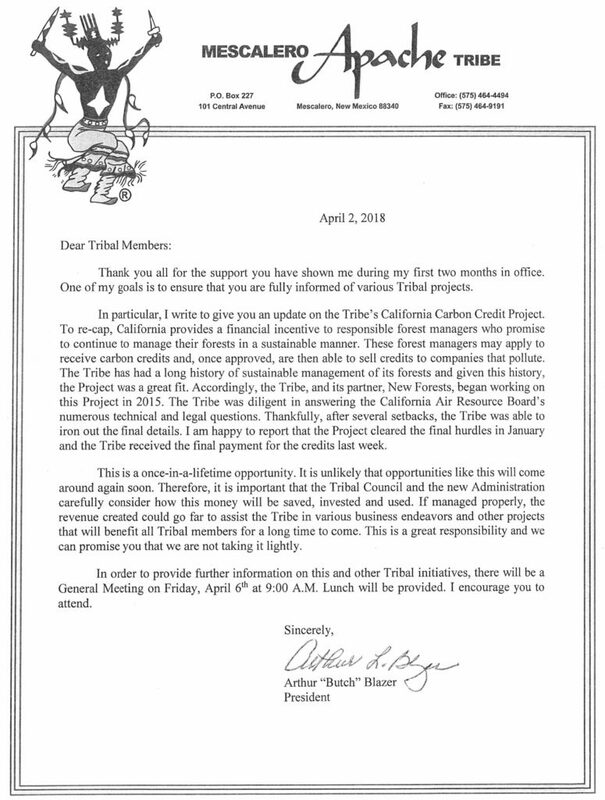 New and returning members of the Tribal Council, Vice President and the new President took time to speak about hopes for the tribe’s future. One occurring theme that was mentioned in each speech was unity. Vice President, Gabe Aguilar mentioned working together with surrounding towns and villages like Ruidoso, Tularosa, and Alamogordo. Economically helping one another’s town or village may help our tribe in return. “We all have something valuable to offer to the team (tribal government and tribal members)” as stated by councilwoman, LeClaire Gayton. The idea of teamwork was mentioned numerous of times. Council members, Vice President and the President had a collective understanding of what it takes to come together and work for the best interest and welfare of the Mescalero Apache tribal members. 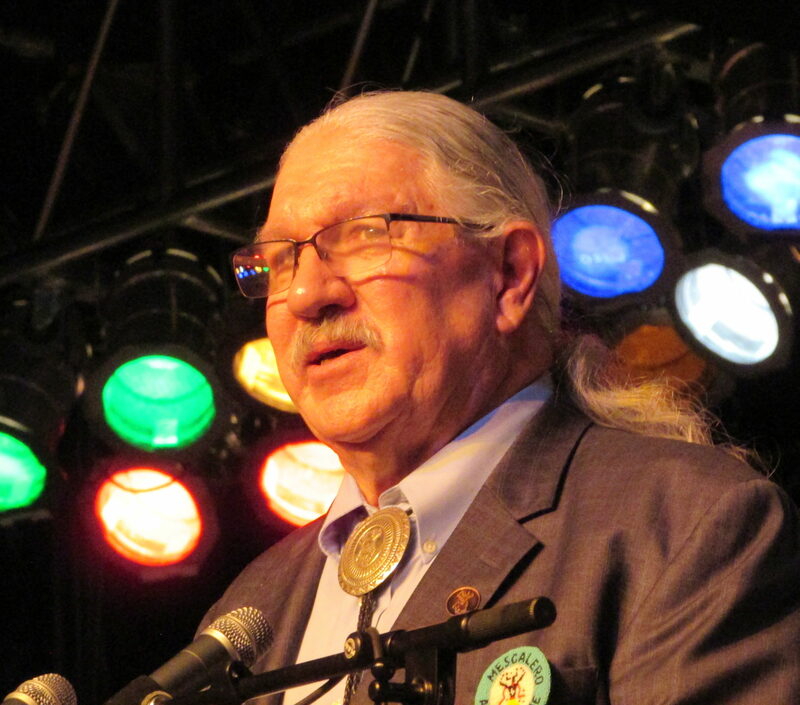 When asked why Mr. Blazer competed for the seat as tribal President, he said, “It was for my love and willingness to help my people.” Mr. Blazer joins the office with a great deal of knowledge in natural resources, amongst other things. Not to mention his many business relationships with various distinguished leaders at the tribal, state and government level. “I will use the resources I know to help our tribe.” said Mr. Blazer. The Tribal Council, Vice President and President maintain five committees within the tribal government realm: Butch Blazer is chairman of the Executive Committee, Sandra Platero is chair of the Tribal Programs Committee, LeClaire Gayton will continue being chair for Tribal Community Services Committee, Marilyn Blaylock is chair of the Tribal Resources Committee, and Pascal Enjady is chair of the Tribal Cultural Committee. Each committee is assigned different responsibilities according to the type of committee they stand in. With exception of executive and cultural, all committees have three members. With the new term beginning, returning and new tribal officials are eager to start helping and making decisions for the benefit of all tribal members. One of the well known billboards that greet visitors along the highway was recently covered with a new vinyl sign. Our high school students in Ms. Lane’s art class collaborated to redesign the classic billboard at the bottom of route 6. The widely known billboard went through some major wear and tear resulting in the paint fading and tearing. One could say that the sign has been up for longer than 45 years; since the 70’s! From that time, the billboard was repainted and covered with other vinyl signs. Ms. Lane and the students expect their sign to be up a lot longer. When asked about having his art work on the recreated billboard, Nana Chee said, “It feels good.” He feels the sign will be up longer since the material is more durable to weather conditions. When creating the billboard, the art students didn’t want to veer far from the original painting. The mountain, moon, crown dancer, and text are still apart of billboard but in a different format. The mountains were Photo-shopped and added to an evening sky backdrop. The crown dancers were hand drawn by Nana Chee and digitally added in front of the mountains. The text, which is almost identical to the original billboard, was also digitally added. The moon and star were carefully discussed and designed according to Native tradition. Ms. Lane plans to further the students’ knowledge in digital formatting with some help from new computers she hopes to obtain in her art classroom. Superintendant Charlie Sevedra also added that the art students will later cover the other remaining billboards located near the sawmill, Casino Apache Travel Center and on highway 244 near Cloudcroft. We are a locally operated program that equips, trains, and licenses foster parents from Mescalero, Otero and Lincoln Counties to Foster children and youth from the Mescalero Reservation. Do you have the desire and the ability to provide a safe and stable environment to a child in need of foster care? Application – call, email, or come by our office and get an application. Fill it out and get it back to us as soon as possible. We will conduct an orientation with you explaining the process and what foster care entails. Finger prints and background checks – we are required to have all foster parents complete the finger printing process and sign a release of information for background checks. Home study – this is a detailed document that covers your history, your upbringing, your motivation to parent, your relationships, your home, and other information pertaining to your background and lifestyle. Training – all prospective parents are required to participate in the parent training. This usually starts during the home study process. The training is geared to give foster parents resources, tools and behavior management skills for parenting a foster child/children. License – once you have completed the requirements of becoming a foster parent you will be officially licensed. Do you want to affect a child’s life in a positive way? Call now and begin a journey that is rewarding and will change a child’s life! We are members of NICWA. 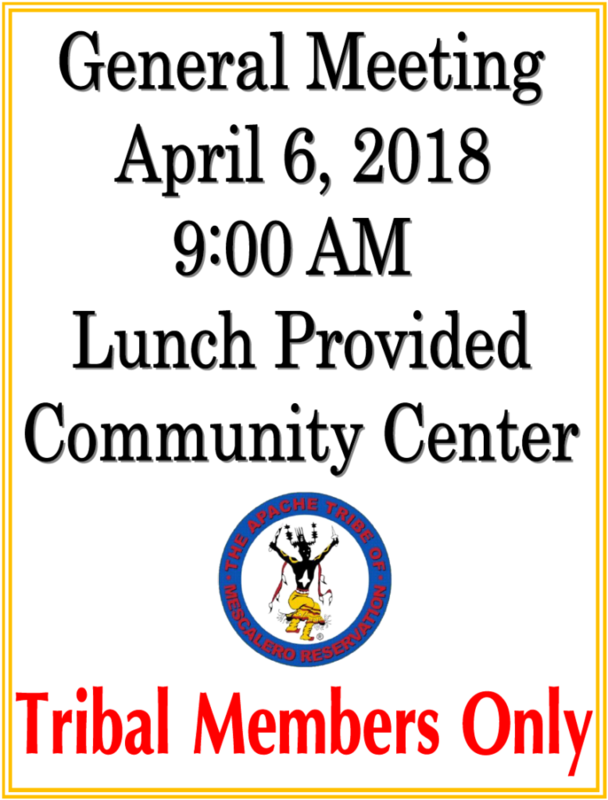 The National Indian Child Welfare Association improves the lives of American Indian children and families by helping tribes and other service providers implement services that are culturally competent, community-based, and focused on the strengths and assets of families. 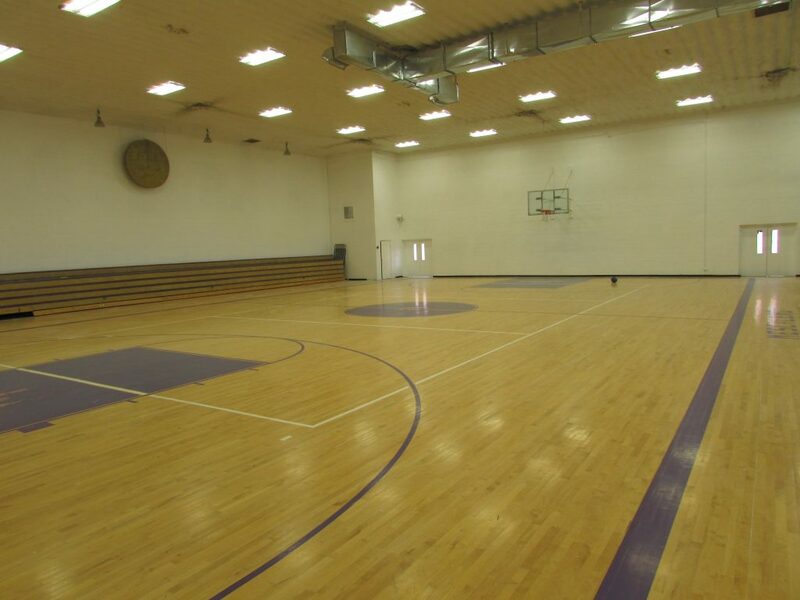 After more than 15 years, the Mescalero Community Center recently had renovations done to the gymnasium and public restrooms. 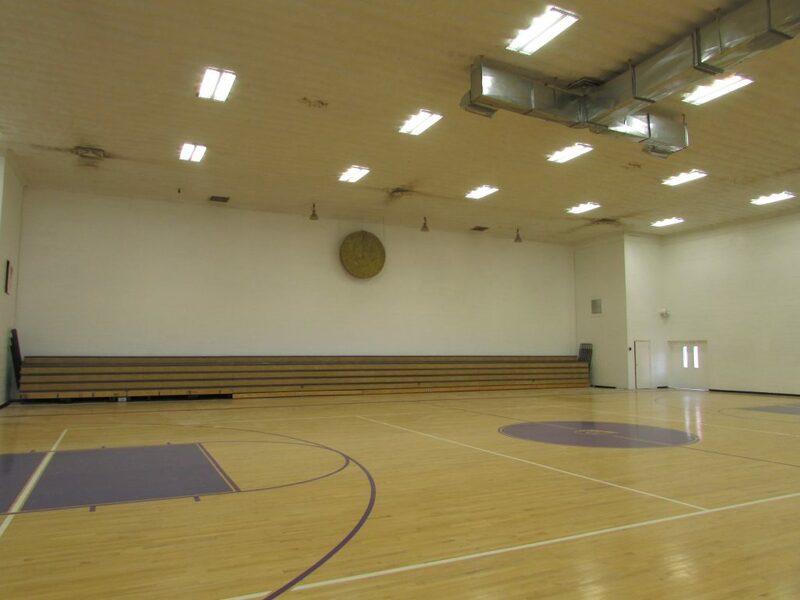 In early July 2016 as the “Kickoff Project” the gymnasium walls were repainted and years of fading and stains were removed and new life was breath into the gym with fresh white paint. 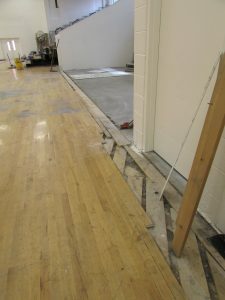 Once all the paint had dried, the refurbishment of the gym floor got underway. Starting in August, the Center Maintenance crew began clearing away anything that wasn’t needed for the refurbishment. 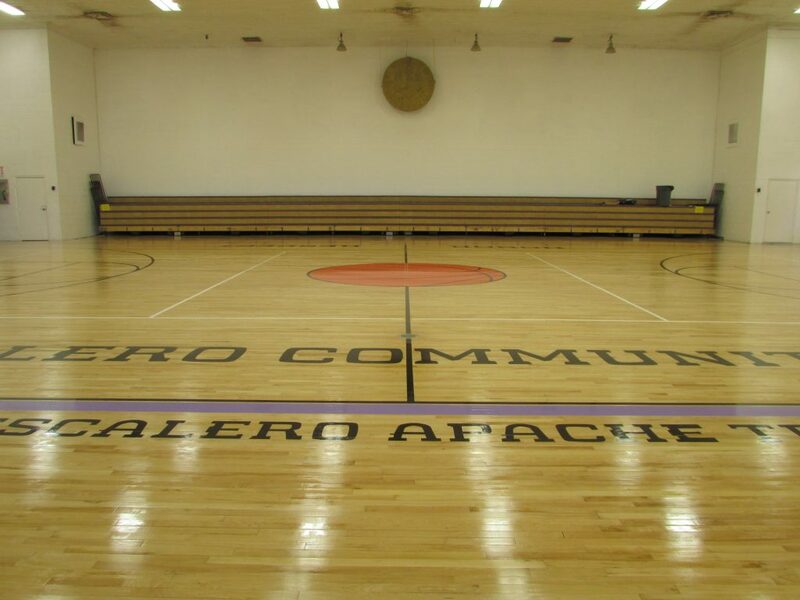 With the completion of the refurbished gym floor, the Center Maintenance crew, along with Administration, have taken steps to protect and maintain the gym floor and the financial investment made on behalf of the tribal membership. 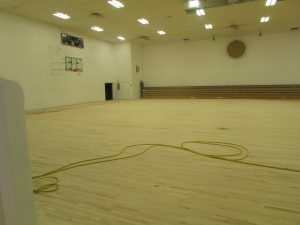 As a result, certain activities will be prohibited on the new gym floor. 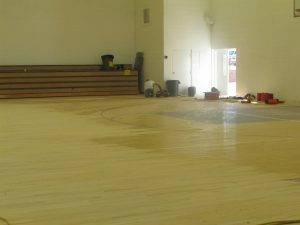 Activities that may damage the new finish on the flooring will likely cease be held in the gym. The major concern for the flooring is assuring its pristine condition. 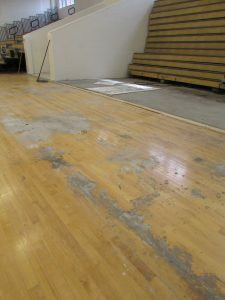 Food, un-hygienic substances, debris, and trash were the primary causes of the deterioration of the old floor and presented a major setback in getting the gym refurbished as many hours were spent cleaning the gym before the renovation could take place. In an effort to make sure our community gym is protected from damaged, only approved activities will be allowed in the gym moving forward. Center Maintenance is looking into new carpet and/or floor covering that would be utilized to protect the gym floor during certain functions. Before, mats were carried and laid out evenly covering the whole gym. The new carpet and/or floor covering would be stored and simply rolled out. 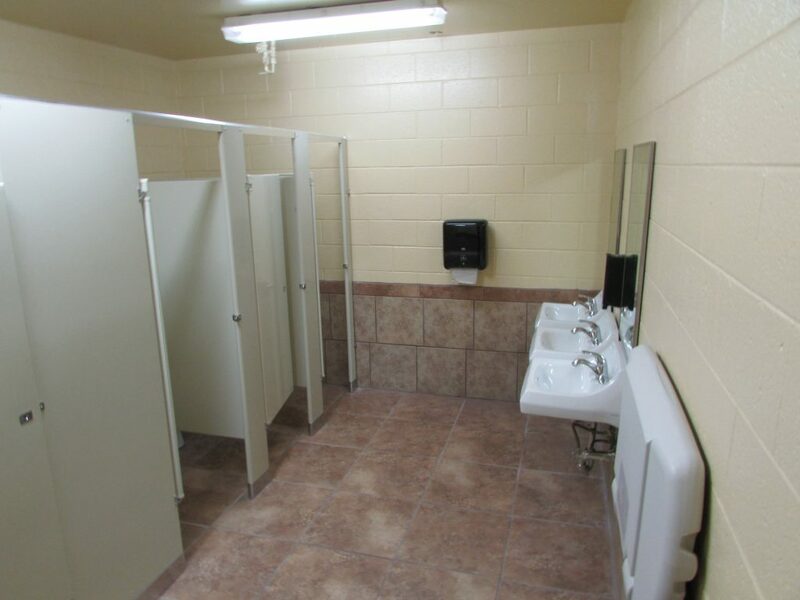 Also in August, the renovation of the public restrooms began. 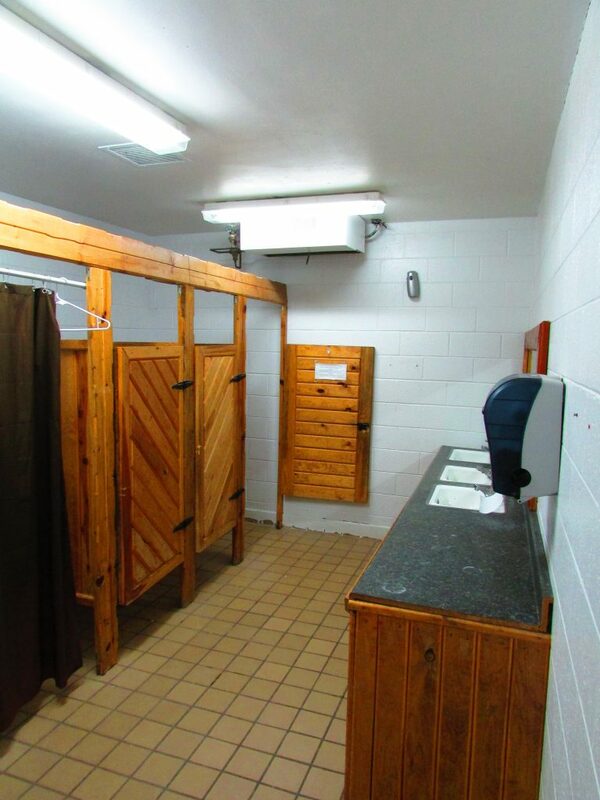 Workers had to totally demolish the men’s and women’s restroom in order for new furnishings to be installed. Parks and Recreation Department Presents. 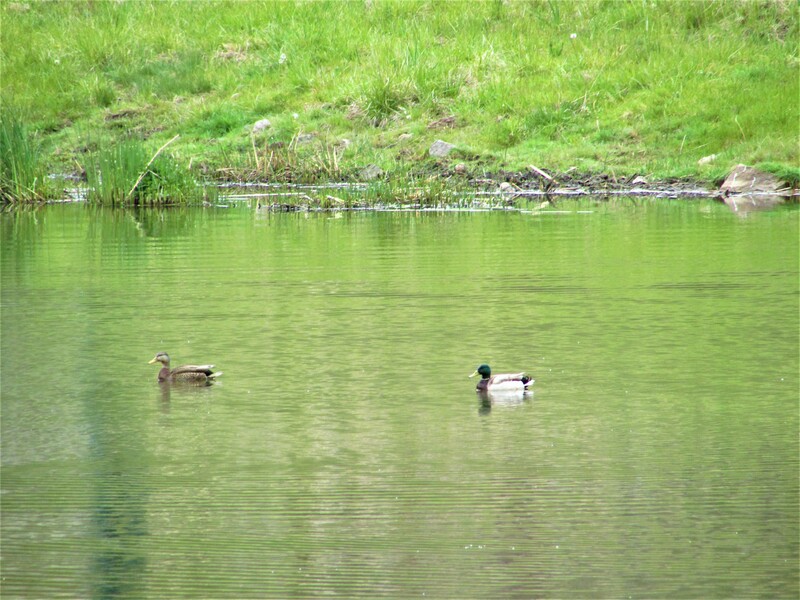 . .
We offer camping, fishing, and RV’ing. Plus free WI-FI! RV $30.00 per night, additional $1.00 for each person per night. Tent camping $15.00 per night, additional $1.00 for each person. Fishing $15.00 per pole, limit of 5 fish per pole for adults. $9.00 per pole for children under 12 year’s old, limit of 5 fish per pole. No New Mexico License required. Picnic $15.00 per car load. RV and Camping are a first come first serve basis. Monthly rates for RV camping will be coming soon. Wood is on sale at the camp areas and prices vary from $10 – $15 per bundle. Ice is also for sale. 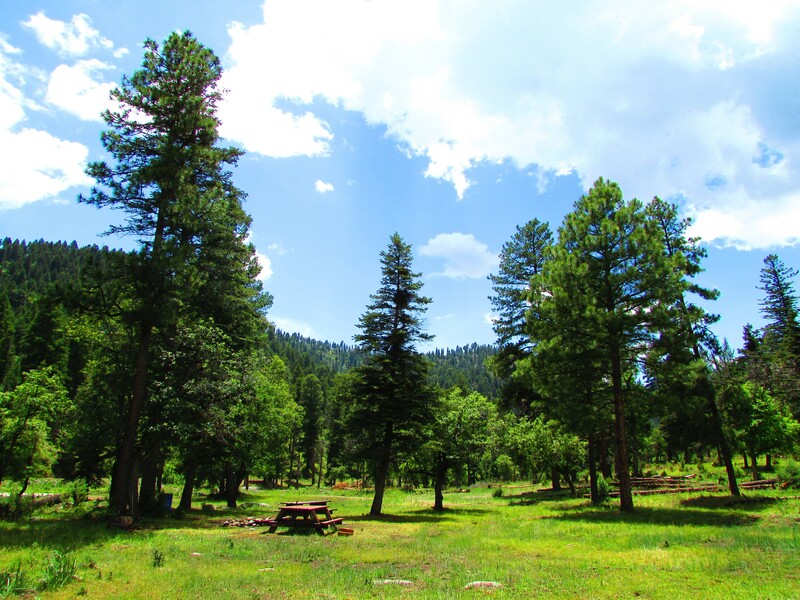 Camp fires are allowed on all campground areas depending on Fire Danger. Also, there is the Casino Apache Travel Center and Inn of the Mountain Gods Resort & Casino 45 minutes away from Silver Lake Campgrounds. For more information please call (575) 464-4494. On the cool crisp evening of March 1, 2016, members of the Mescalero Apache Tribal Council, administration executive staff, IMG executive Staff and Labatt Food Service executive staff congregated in Wendell’s Steak and Seafood restaurant to welcome in, on the menu, a new product produced on the Mescalero reservation. On this evening, guest were given the opportunity to taste and help launch Mescalero Apache steaks on the menu at IMG’s Wendell’s Steak and Seafood restaurant, and not just any steak but USDA Certified Choice and Prime cut steaks, the best of the best. Tuesday night’s event marked the culmination of four years of meetings, presentations, and a lot of hard work on the part of many people. Without the patience of Labatt Food Service and the commitment of all those who work for the Mescalero Cattles Growers, Mescalero Beef wouldn’t be a reality within the tribal enterprises. The journey began in 2012 when the New Mexico Indian Affairs Department (IAD) and Labatt Food Service (Labatt) partnered together to create and launch the “Native American Beef Program”. IAD and Labatt set out to find tribal partners who wanted to participate in the program and began meeting with various tribal leaders and tribal councils. The first participants in the program was a conglomerate of Navajo Ranchers on the Padres Mesa in western New Mexico and Eastern Arizona and the first wave of beef to hit the markets under the Native American Beef program was Navajo beef. IAD and Labatt continued their out reached and even came to Mescalero at the time to pitch the idea as a catalyst to jump start Mescalero’s beef industry but found little interest at the time amongst the council members. 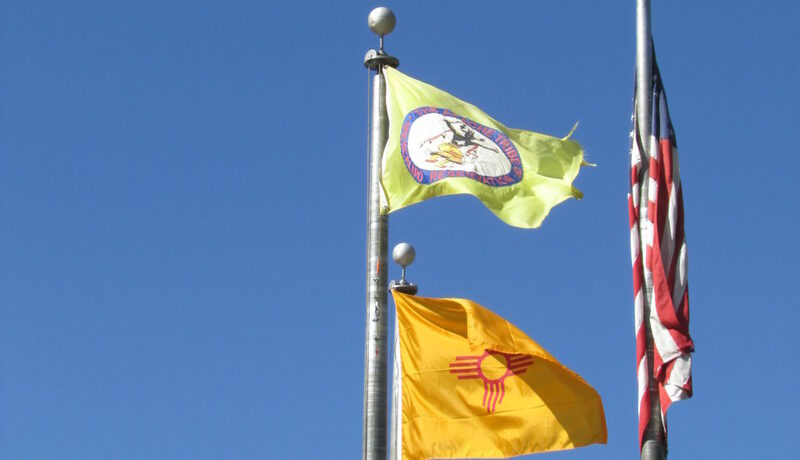 Together, IAD and Labatt pushed forward seeking tribal partners and eventually partnered with the Jicarilla Apache Tribe’s rancher association. It wasn’t long before Jicarilla raised beef and was being featured in the tribe’s casino restaurants for all to enjoy while partaken in its unique taste. In January of 2015, changes in IAD’s administration occurred which refocused the priorities of department; while still supportive of the Native American Beef Program; IAD began addressing other issues within tribal communities which left Labatt to continue its outreach alone. Labatt again approached the Mescalero Apache Tribe and were finally given an opportunity to bid during the tribe’s next cattle sale. Labatt offered its bid and came out on top which then kick started the initiative to bring Mescalero Beef into the tribe’s enterprises. Labatt has since been working closely with the tribe’s cattle manager and the all the cowboys at number one. According to representatives from Labatt, when they bought cattle from the tribe, it was the first time that all beef produced rated USDA certified Choice or Prime. Councilman Christie Lapaz, Jr. also said a few words and started out by jokingly saying, “I came here tonight and I’m a vegetarian.” He continued by saying, “This is a good thing for the tribe, this is something I never thought would happen and I am proud of the guys at Cow Camp.” His sentiments were echoed by many of the night’s guest and all those present enjoyed the exceptional meal that was prepared by Wendell’s staff. 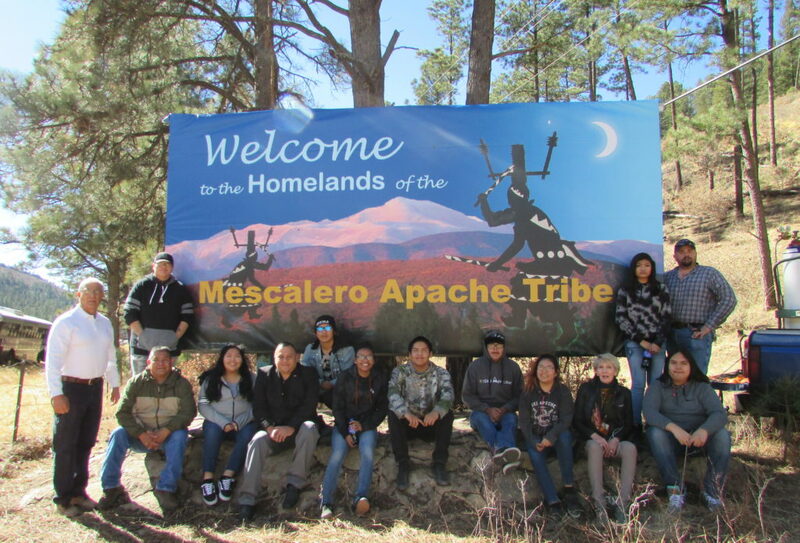 A short video was produced about the program at Mescalero and featured a number of tribal members, the video can be found on YouTube if you wish to view it. Mescalero Beef is a quality product produced on the Mescalero Apache Reservation, it is all natural and grass fed. “We are excited about the opportunities this endeavor will bring to the tribe and are extremely proud of the high quality of our beef.” stated Gabe Aguilar, Vice President of the tribe. RV – $33 for first 2 people, additional people in vehicle is $1/night. TENT – $20 for first 2 people, additional people in vehicle is $1/night. CAMPING IS FIRST COME, FIRST SERVE. Limit 5 fish per permit. Good, day of purchase of only. Parks and Recreation is not responsible for any accidents, theft or injury.